Pega Sales Automation™ includes a sample application that you can use to demonstrate the application's features. You can use Pega Web Mashup with Pega Sales Automation to expose a section as a form on a customer-facing website to generate leads in the application. Sample Pega Web Mashup rules are provided in the SAPlus sample application so that you can demonstrate lead capture from a web form. Before you can demonstrate this feature, configure a gadget by using Pega Web Mashup and embed it in the BusinessLeadCreationScreen section in the sample application. PegaA_params=[UserIdentifier:" ", Password:" "}– Enter the credentials for any operator in the sample application. Add the BusinessLeadCreationScreen portal to the access group for the operator that you specified in the HTML source for the BusinessLeadCreationScreen section. Use this operator to demonstrate the lead capture process. If you need to change the UI for the gadget, you must update the user interface rules that are defined in the New_Web and Confirm_Web harnesses. 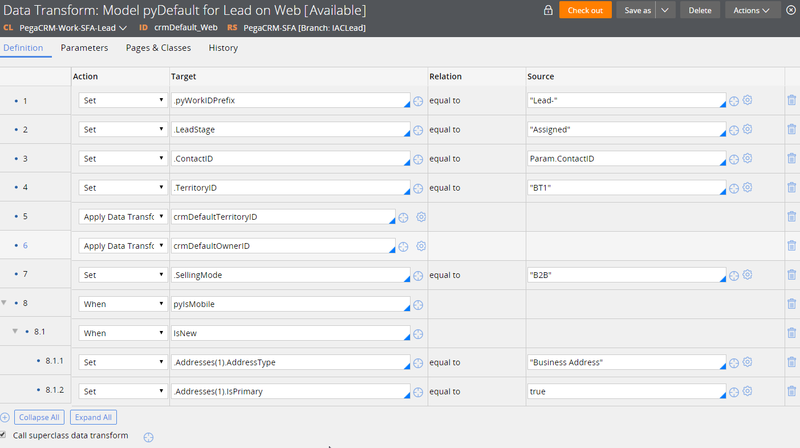 The default values for the new lead that is created from the gadget are defined in the crmDefault_Web data transform. The default territory for the new lead is BT1 (that is, Global). The default owner for the new lead is the operator that is used to authenticate the gadget. The default stage for the lead is Assigned. You can modify the default values for your implementation as needed.